The 2003 Government Procurement Reform Law sought to reform government procurement procedures in order to eliminate or minimize procurement-related corruption by mandating a more transparent process. This includes the presence of third party observers in the activities of the Bids and Awards Committees that approves these procurements. Millions and even billions of pesos of local government funds are allegedly lost due to corruption in the procurement and use of vehicles. 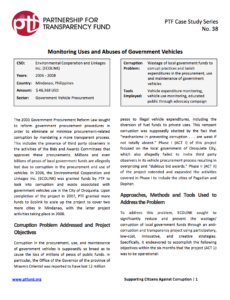 In 2006, the Environmental Cooperation and Linkages Inc. (ECOLINK) was granted funds by PTF to look into corruption and waste associated with government vehicles use in the City of Oroquieta. Upon completion of the project in 2007, PTF granted more funds to Ecolink to scale up the project to cover two more cities in Mindanao, with the latter project activities taking place in 2008.